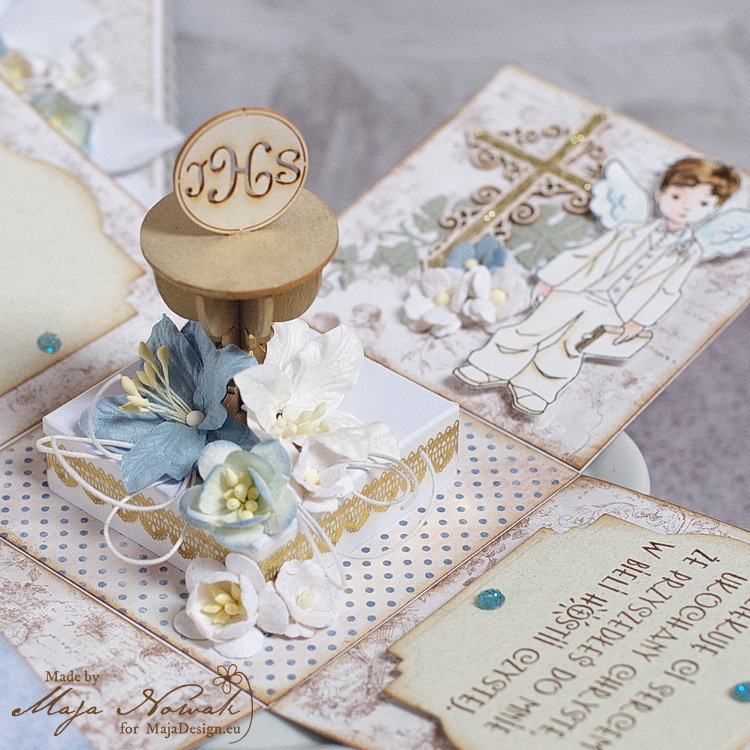 Good morning, dear Maja Friends, welcome to the blog today! I combined two collections in the box, and they are both perfect not only because of beautiful colours and elegant patterns, but also because of their names! 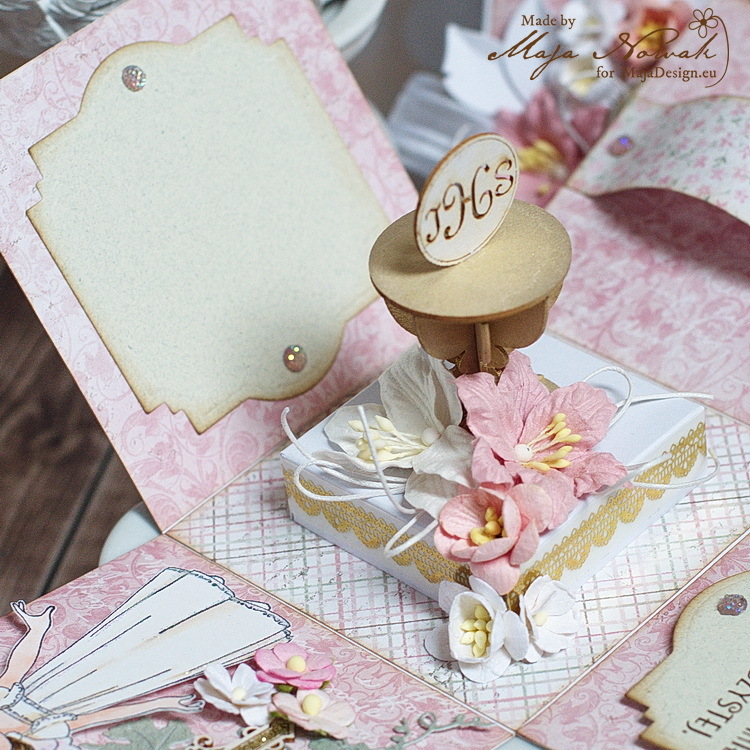 Mix Vintage Romance with Celebration and you have a perfect wedding project. 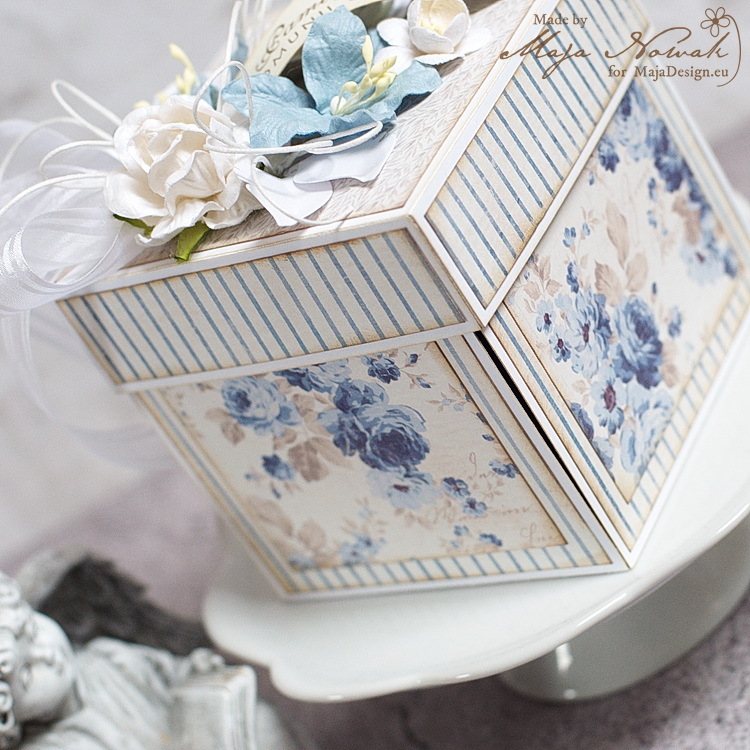 I matched the flowers I used for the box with the printed ones of the Engagement sheet. And how do you give cash presents to the newlyweds? Just an envelope or something more elaborate? 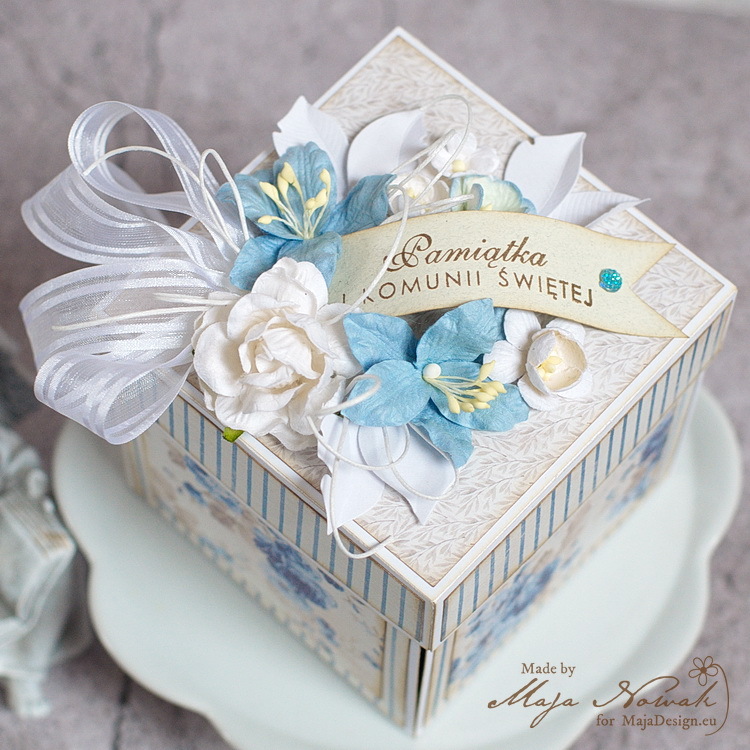 Other: flowers: Prima, Wild Orchid Crafts; chipboard cake: Wycinanka.pl; dies: Crealies; ribbons, cheesecloth, pearls: my stash. 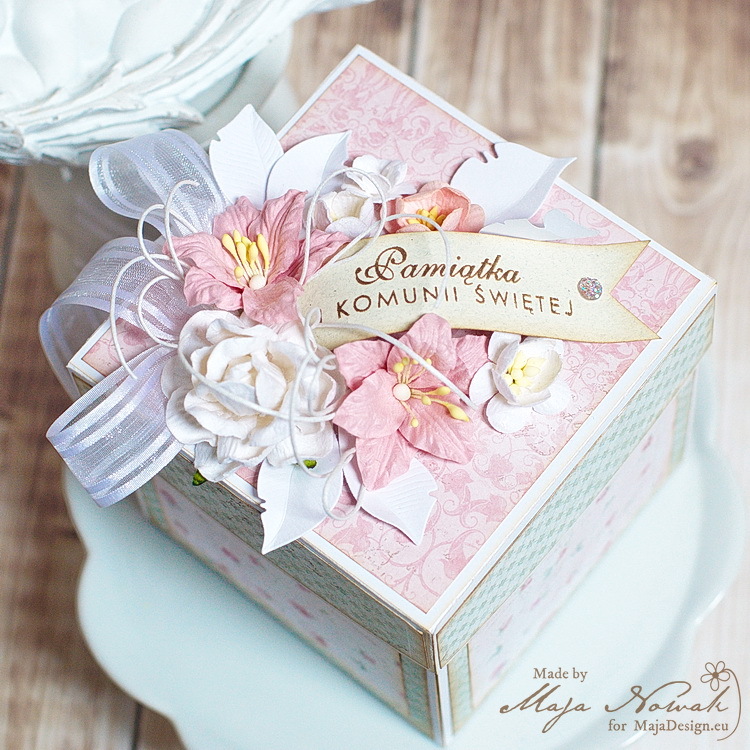 I really like the way the box turned out, elegant and light! What do you think? 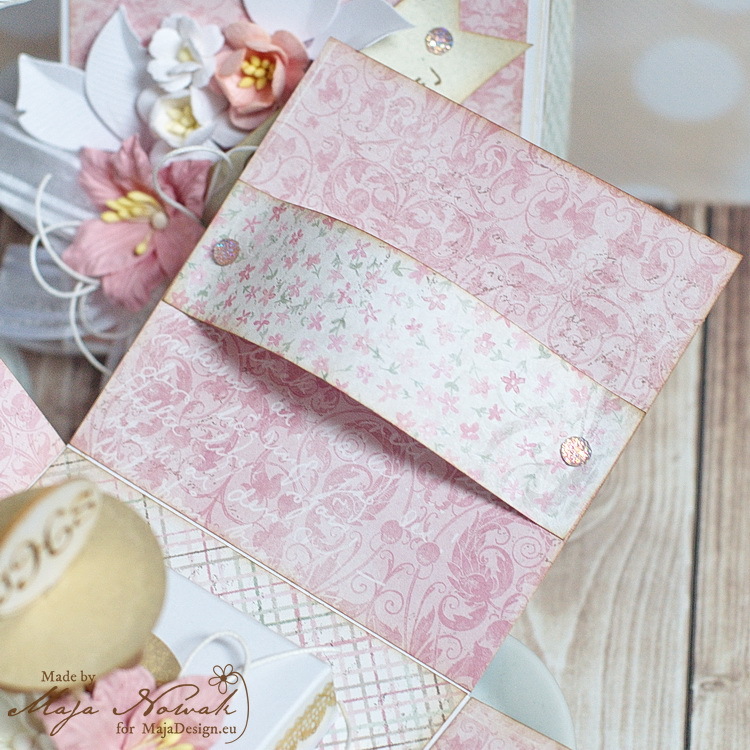 Other: flowers: Wild Orchid Crafts; dies: Spellbinders; chipboard: Wycinanka.pl, ribbon, lace: my stash. And that’s all for today, thank you for visiting and see you soon! Hello there, dear Visitors to the Maja Design blog! Maja Design papers are perfect for elegant or formal occasions, their subtle, classic designs and delicate colour palettes perfectly match the chosen theme. I really like how this boy box turned out! Other: stamps: Whiff of Joy, Lemonade; chipboard: Scrapiniec, Anemone; dies: Magnolia, Spellbinders; flowers: Wild Orchid Crafts; Distress inks, glitter: Ranger; wax string, bling, washi tape: my stash. 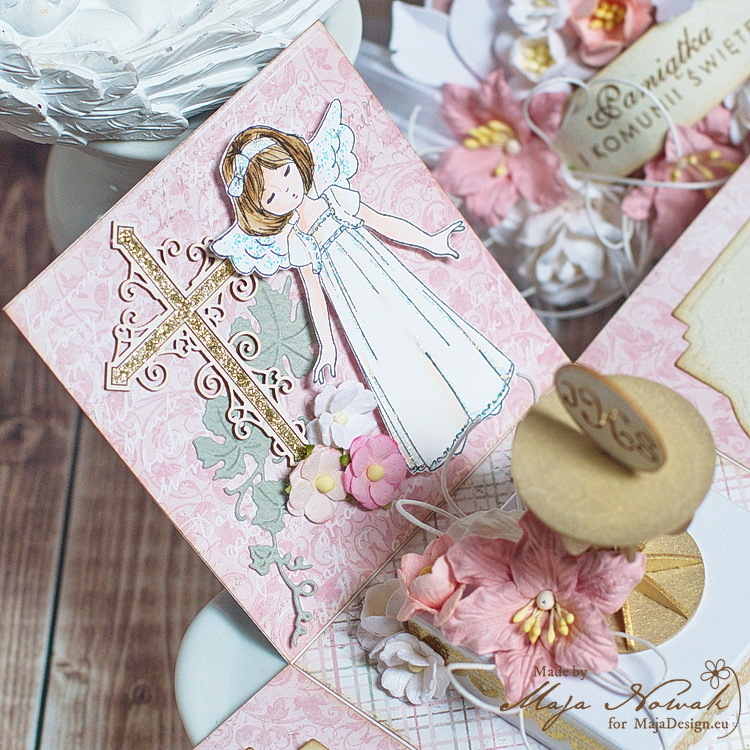 I decorated on of the sides with a stamped girl image that I hand-coloured with Distress inks, and a chipboard cross with the flower cluster – I die-cut hte vine leaves from the green paper of the Monochrome pad – I just love this addition! 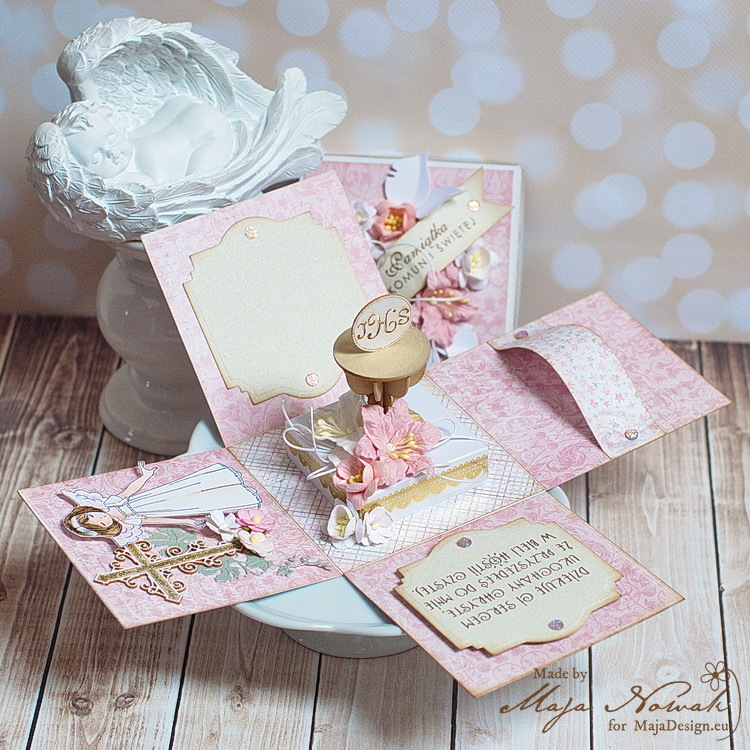 Other: chipboard: Scrapiniec, Anemone; stamps: Whiff of Joy, Lemonade; dies: Magnolia, Spellbinders; flowers: Wild Orchid Crafts; Distress inks, glitter: Ranger; wax string, bling, washi tape: my stash. 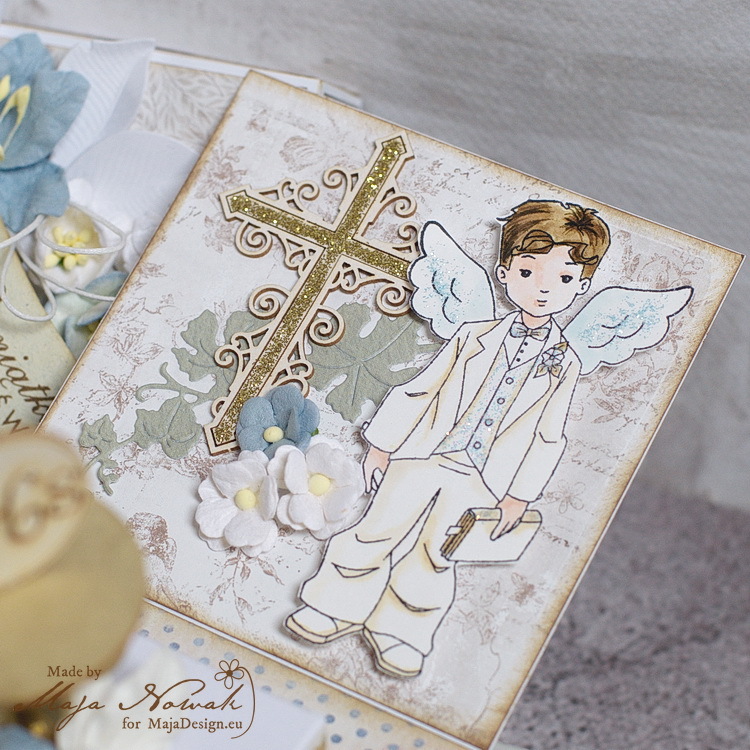 And what is your idea for the First Communion gift? Hello Maja Fans and welcome to the Maja Design blog today! Last time I shared a flowery boy layout. But when boys are growing, you need to forget flowers, I guess – especially when you create things to order. And so recently I’d got two orders for birthday creations on the occassion of boys’ 18th birthday, which is the official maturity age in Poland. Maja Design papers: Life by the Sea: Nautic, Nautic bs, Drop the anchor, Bottle message bs. Other: stamps: Crafty Individuals and Lemonade, stickers Glitz, dies Die-Namics, charm, string, cheesecloth, seashells – from my stash. 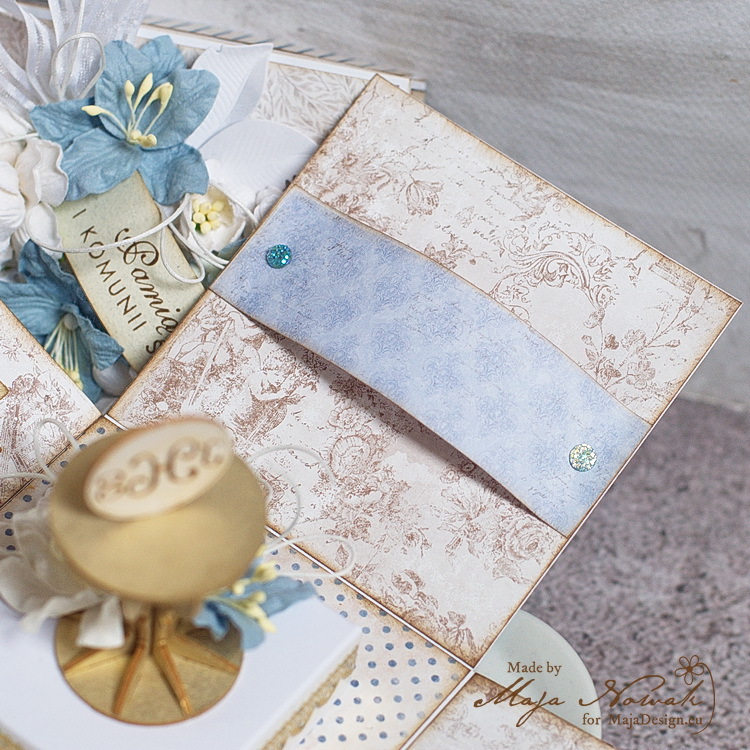 I decorated the cardstock base with a mixture of Maja winter collections – mostly using the Vintage Frost Basics papers – in a way that it looks like a traveller’s chest, with belts and “metal” corners. On the lid I put a mini toy car, chipboard gears and stars that I embossed with silver mettalic ep. Other: printed images, brads: Rayher, stickers 7 Dots Studio, chipboard shapes Scrapiniec, dies Cheery Lynn Designs, glitter Stickles Ranger; washi tape, flowers, toy car – from my stash.